Some customers do not want to provide their credit card information or want to pay based on their payment terms. These customers still can pay their invoices via credit card through a payment portal. This payment portal is a service provided by the gateway, where customers can go to and securely enter their credit card information. Payments made through the payment portal will be downloaded into NAV-X Credit Card for Dynamics NAV. These payments then will be posted against the customer’s ledger entries and applied to invoices to close out the appropriate invoices that were paid. Customers can also enter credit card information securely in the portal and the tokenized information for these credit cards will be downloaded into NAV-X Credit Card for Dynamics NAV. 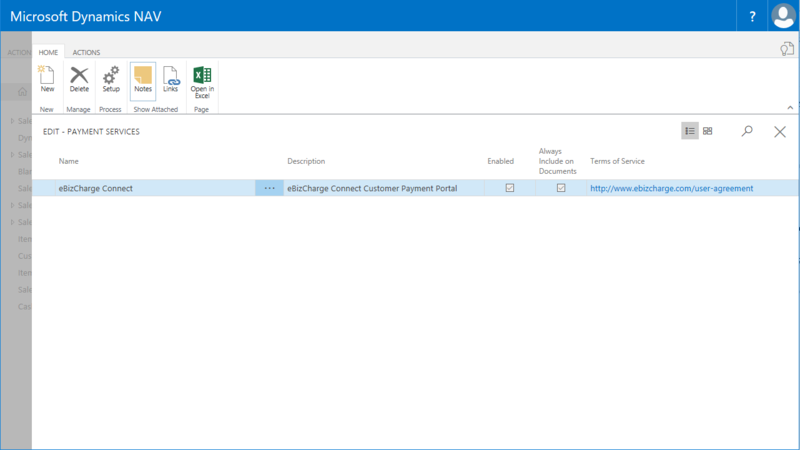 Those credit cards then can be used to process orders or invoices via credit card from within Dynamics NAV. The advantage this provides is that your customers do not have to provide you with the credit card information and therefore adds additional security to the credit card payment process. To be able to use this functionality, a new payment service has to be setup. You can access the page “Payment Services” through the search box. 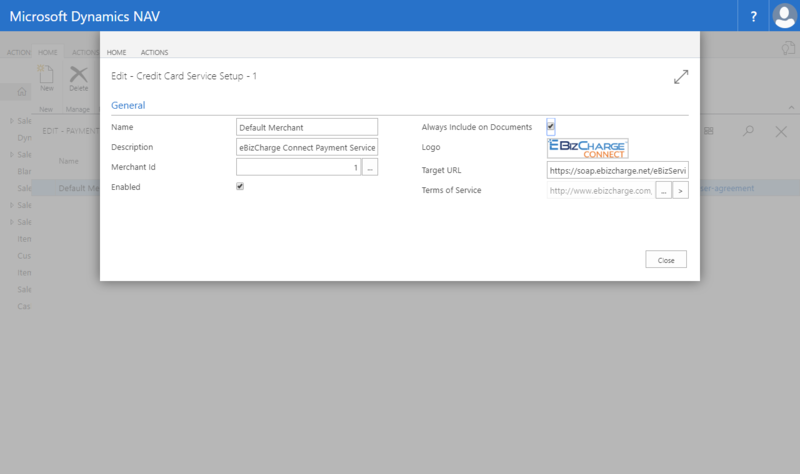 One payment service with the name “eBizCharge Connect” will be setup automatically. For each merchant account defined in the setup, a separate payment service is setup automatically. While you can make changes to this setup, you should not change the login information, but should provide them in the merchant setup. To configure the payment service, select it an click on the action “Setup”. This will open the payment services card. You can enbale or disable a particular payment service by checking or unchecking the field “Enabled”. If the payment service is not enabled, you cannot use this payment service. If you want to include this payment service as the default service on all invoices, you can select the “Always include on Documents” flag. If this is not selected, you can still define the payment service to be used for specific customers or on specific documents.